Why is inkscape snapping to grid *lines*? While trying to edit a certain document, I noticed that inkscape is snapping to grid *lines*, which is making it annoyingly difficult to do what I want, which is only snap to grid *intersections*. I can't find any option to control this, and even more bizarrely, if I create a new document, I only get snapping to intersections, as desired. What is going on here and how do I fix it? I'm guessing the grid is higher resolution. I'd try zooming in a lot to see if there are more lines. Well, you could upload an example file and post a link to it for examination. Thanks for the files and pic. I am able to duplicate the behavior by setting the snaps in the Document Properties panel to snap to grids only when within 10px (same as in the example file). 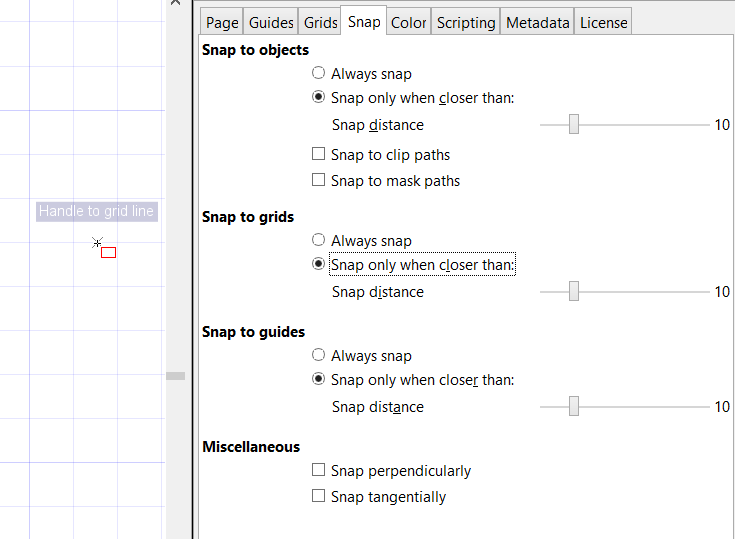 Setting the snap-to-grids to "Always" forces the snap to the grid intersections. Please chime back and let us know you get along. At any rate, the answer to the original question appears to be "because that's what it does when snap to grids is set to 'only within X'". Now... I suppose the next question is, is it *supposed* to do that? Thanks TylerDurden, that solved my question. I'll file a bug/wishlist report to suggest a label change from "Always snap" to "Only snap to grid intersections". It seems that's a more accurate description of the behavior. Please visit the report and click the "This bug affects me" button.